Our Villi has come to us from Finland in the year 1995. She has very kind temperament and is a really show-dog. Her show career is fabulous. We thank my finnish friend Jaana for Villi very much! Villi had her first litter in the year 1998 and now she continues in shows. Take a look to her show results in the year 1999. Her babies are very successful too, six from them are Champions. 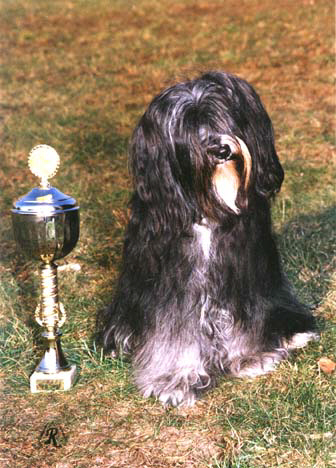 She is the most successful Tibetan Terrier in the Czech Republic. She has become Czech Champion of Champions 1999 and Top TT of the Year 1997, 1999, 2000. Her daughter Jomi has stayed by us.